Tsai Huang-liang is the director of the Democratic Progressive Party’s Culture and Information Department. In other words, he is their chief demagogue. On February 27, 2006, Tsai Huang-liang posted an article at the Taipei Times, posing the rhetorical question, “Would Ma allow vote on nation’s future?” In posting the article and posing the question, Tsai was fulfilling his duty as chief demagogue. He was preaching Taiwan independence doctrines he knew to be untrue to Taiwan independence fundamentalists he knew to be idiots. Tsai’s smarmy, self-righteous question for KMT Chairman and 2008 presidential hopeful Ma Ying-jeou was a rhetorical trap intended to achieve one of two results. If Ma were to yield to such pressure and make such a public declaration, the Taiwan independence nomenklatura would have extorted a strategic concession from the undisputed leader of the Pan Blue alliance, for which there would be hell to pay down the road. Ma would either have to repudiate his initial concession, in which case he would come across as weak and indecisive, or he would have to make endless future concessions consistent with his initial concession, in which case the both the Kuomintang and the Republic of China would be forever lost. Two, if Ma Ying-jeou remained sufficiently alert to steer clear of Tsai’s rhetorical trap, Tsai would attempt to make Ma’s refusal to take the bait appear guiltily evasive. If this sounds like a case of “you can’t win for losing,” you’re right. Finding oneself trapped in such a no-win situation is the predictable result of ideological confusion. Ideological confusion leads to ideological self-doubt. Ideological self-doubt leads to ideological evasion. Ideological evasion leads to ideological passivity, to a cringing, defensive political posture in which one waits to be hit and is too cowed by “unearned guilt” to even complain. The only escape from such a dilemma is to stop defending and start attacking. In politics as in sports, the best defense is a good offense. To stop defending and start attacking however, one must first clarify ones’ own ideological position and confirm that one holds the moral as well as practical high ground. Only then can one seize the initiative and go on the offensive. Let’s see how Tsai is guilt-tripping Ma Ying-jeou with Taiwan independence Political Correctness, and how Ma Ying-jeou can turn things around. Pan Blue Rebuttal: Let’s not mince words. Tsai may be wrong about everything else, but he’s right about the ill-conceived KMT ad. The KMT ad in the Liberty Times was a fiasco. It “gave away the store.” KMT Chairman Ma Ying-jeou had to repudiate it, and having repudiated it, must not second-guess himself. What democracy? The Republic of China is not a democracy. It is a republic, a constitutional republic. Under a democracy, there are indeed “many options for the nation’s future,” because under a democracy anything goes. A democracy, as Thomas Jefferson warned his fellow Americans, “is nothing more than mob rule, where fifty-one percent of the people may take away the rights of the other forty-nine.” History has since proved Jefferson and his fellow Founding Fathers right, many times over. Perhaps the most sobering proof that democracy is nothing more than mob rule surfaced in 1935, when an economically prosperous, culturally advanced Western European democracy enacted the infamous Nuremberg Laws, stripping away the rights of a defenseless minority. Under a republic, on the other hand, there are very few “options for the nation’s future,” because under a republic, not everything goes. Under a republic “options for the nation’s future” are severely limited by the nation’s constitution. Under a constitutional republic, explicit constitutional constraints protect minorities and individuals from capricious mob passions. For the record, the Constitution of the Republic of China, like the constitution of most nations, does not include the option of independence. What modern Americans refer to as “America” or “the USA” is technically a confederation of independent states. Retaining pre-existing sovereignty and independence within a confederation such as these United States of America, is an entirely different matter from acquiring independence from a pre-existing unitary state such as China. Does Tsai Huang-liang not know that the choice was made by the people? The choice was made by the people in 1912, when the Constitution of the Republic of China was enacted, just as the choice was made by the American people in 1789, when the Constitution of the United States of America was enacted. Unless the alternative under consideration is market anarchism, in which we are talking about a whole other ballgame, then the Constitution of the United States is a perfectly serviceable constitution. The fact that it is over 200 years old isn’t a problem. It merely needs to be honored instead of ignored. It isn’t a “living, breathing document” with “penumbras and emanations” that need to be “interpreted.” It’s written in English, not Chinese. Sun Yat-sen is the George Washington of modern China. Sun modeled the Constitution of the Republic of China on the Constitution of the United States of America. The Constitution of the Republic of China is also a perfectly serviceable constitution. The fact that it is nearly 100 years old isn’t a problem either. It too merely needs to be honored instead of “amended” irresponsibily on an annual basis. The Constitution of the Republic of China is a One China Constitution. There is no Two Chinas Constitution. There is no One China, One Taiwan Constitution. It doesn’t need to be “interpreted.” It’s written in Chinese, not English. Pan Blue Rebuttal: God, I hope so. I certainly hope there are “fundamental differences between the KMT’s and DPP’s approach to the future of Taiwan and their definitions of democracy.” God forbid that the KMT’s approach to Taiwan’s future and to “democracy” bear any resemblance whatsoever to the DPP’s. The KMT’s approach to the future of Taiwan is embodied in the Constitution of the Republic of China, which was authored by KMT party founder Sun Yat-sen. The Republic of China, or ROC, has democratic features, but it is not a democracy. It is, as its name implies, a republic. A republic is governed by its constitution. According to the Constitution of the Republic of China, or ROC, Taiwan is a province of China. According to the Constitution of the People’s Republic of China, or PRC, Taiwan is also a province of China. Both the ROC and PRC consider Taiwan a province of China. Every one of the 25 nations that maintains diplomatic relations with the ROC government in Taipei considers Taiwan a province of China. Every one of the 165 nations that maintains diplomatic relations with the PRC government in Beijing considers Taiwan a province of China. The United Nations considers Taiwan a province of China. The whole world considers Taiwan a province of China. The KMT’s approach to the future of Taiwan respects both this undeniable political reality and the ROC Constitution. The DPP’s Resolution on Taiwan’s Future is what Chinese refer to as “zi qi, qi ren” or “self-deception, and deception of others.” It is a futile attempt by the DPP to convince themselves and the outside world that Taiwan is not an integral part of China. Unfortunately, try as they might, DPP officials have never been able to convince even themselves that “The Republic of China is Taiwan, and Taiwan is the Republic of China.” They know “it just ain’t so,” and the knowledge sticks in their craw. That’s why they keep returning to previous, more extreme demands for a “Taiwanese Constitution” in 2006, and a formal declaration of Taiwan independence in 2008. Pan Blue Rebuttal: What do Tsai and the DPP mean when they insist that “including the people on both sides of the Taiwan Strait violates the first principle of democracy?” What kind of arrant nonsense is this? According to the constitutions of both the ROC government in Taipei and the PRC government in Beijing, the territory and populace on both sides of the Taiwan Strait are part of the same nation. By what right does a Quisling nomenklatura on one side of the Strait deny hundreds of millions of fellow citizens on the other side of the Strait the right to determine the future of their own nation? What do Tsai and the DPP mean when they make the ringing declaration: “The DPP’s longstanding position has been to let the people decide the future of Taiwan [by means] of a referendum on sovereignty?” Who are “the people” they refer to? Are they all of the people, or just some of the people? Do they mean the DPP has, unbeknownst to libertarians the world over, suddenly joined the ranks of principled and consistent champions of the Right to Self-Determination? Does the DPP now champion the right of everyone, not just themselves, to secede from whatever political entity they currently live under? Do they mean the DPP now champions the right of Taiwan’s Hakka minority to secede from any future “Republic of Taiwan” and to establish their own Hakka republic? The Chinese province of Taiwan is divided into 23 counties. The KMT, NP, and PFP control 17 counties. The DPP controls only six counties. 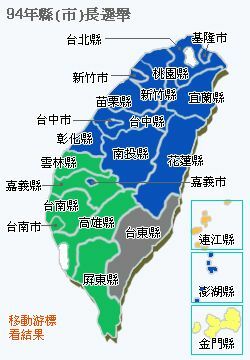 The northern and eastern two-thirds of Taiwan’s land area is under Pan Blue control. Taitung County, in gray, is controlled by independents who are part of the Pan Blue alliance. The outer islands, in orange, blue, and yellow are controlled by the People First Party, the Kuomintang, and the New Party respectively. Do Tsai and the DPP mean the DPP now champions the right of “Greater China” patriots to secede from any future “Republic of Taiwan” and to establish their own loyalist Chinese republic comprising the 17 Pan Blue controlled counties? What they mean is that the Quisling DPP regime will magnanimously “permit” Republic of China citizens to participate in an elaborate charade to found a “Nation of Taiwan,” period. Loyal Republic of China citizens unhappy about suddenly and involuntarily transformed into “citizens of the Republic of Taiwan” will just have to lump it. If only they meant it. Unfortunately, they don’t. What do Tsai and the DPP actually mean? They mean that all options that enable them to get what they want should be open, and there should be no biases or conditions that prevent them from getting what they want. Taiwan independence Quislings are not champions of the Right to Self-Determination. Taiwan independence Quislings are champions of the Right to Self-Determination for Taiwan independence Quislings. Excuse me, but unless Tsai and the DPP are willing to forgo enacting an “Anti-Secession Law” of their own, unless they are willing to guarantee the right of others to secede from their “Nation of Taiwan,” at others’ discretion, not the DPP’s, unless they are willing to forgo national unity and territorial integrity for their newly founded “Nation of Taiwan,” unless they are willing to see their own “Nation of Taiwan” disintegrate before their very eyes, then they had best shut their traps, cease their yammering about “no biases or conditions,” and stop pretending that they occupy the moral high ground on the issue of the Right to Self-Determination. Pan Blue Rebuttal: Tsai’s statement is of course, far too myopic and narrow-minded. The real question is how to let sovereign and independent individuals decide their own futures in an unbiased manner, whether through referenda or other means. This is far more important than accepting any collective’s demands for nation-building. And if truth be told, it is a question in far more urgent need of a response from Tsai Huang-liang than from Ma Ying-jeou. Should Taiwan independence be an option? No. Not if one has one iota of respect for Constitutionalism and the Rule of Law. If the nations of the world wish to abide by traditional rules governing national sovereignty and territorial integrity, then patriotic Chinese on Taiwan and the Chinese mainland cannot be faulted for insisting that Taiwan independence is not an option, that Taiwan independence Quislings have no right to demand secession from China, and that the nations of the world must respect China’s national sovereignty and territorial integrity. Is Taiwan Independence an Option? Backtalk – Is Taiwan Independence an Option?